Ellen Davison has been practicing Buddhist Meditation for over 30 years, in both the Zen and Vipassana (Insight) traditions. After travelling and practising with teachers in Japan, India and North America she moved to Hawaii where she studied with Robert Aitken Roshi, founder of the Diamond Sangha. In Australia she continued her studies in the Zen tradition with Aitken Roshi, John Tarrant Roshi and Subhana Barzaghi Roshi. 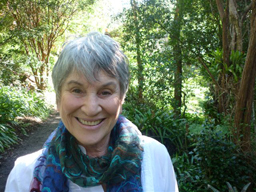 Ellen's interest in Buddhist teachings has also led her to continue to explore the practice of Insight (Vipassana) and Inquiry with Christopher Titmus and Patrick Kearney. Ellen is the resident teacher of the Kuan Yin Meditation Centre in Lismore and a guiding teacher for Bay Insight in Byron Bay. She is a teacher in the Zen tradition of the Diamond Sangha and a member of the Insight Teachers Circle, Australia. A major focus of her teaching is the application of meditation practice to everyday life. Ellen is a psychologist and works as a student counsellor in TAFE. She teaches and leads retreats and workshops in both the Zen and Vipassana traditions within Australia.